The newest release from Omega, the CUBE302S is a low speed masticating juicer with a square footprint and clever design that keeps all its attachments neatly organised in a storage compartment. The Omega CUBE302S presses fruit and vegetables then squeezes their pulp to deliver a juice full of minerals, enzymes, antioxidants and vitamins (read our Omega Profile here for more on the brand and its technology). The Omega CUBE302S has a motor tuned to 80 RPM - this slow masticating speed ensures minimal heat built-up (oxidation) and minimal foaming. Its dual-stage process gives a higher yield and fresher flavour, as well as maintains nutrients alive to deliver a living juice. 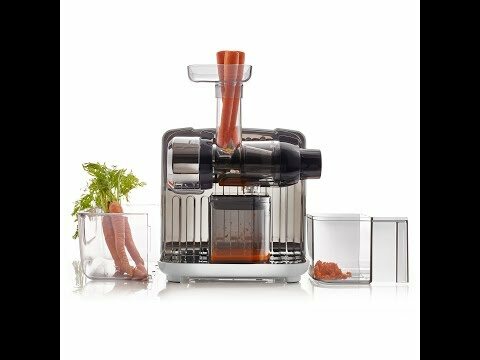 The Omega Cube can handle both soft and hard fruit, stringy veg, wheatgrass, carrots, it can even grind coffee beans and herbs. The continuous pulp ejection means you can use it without having to start and stop frequently, perfect if you want to make a larger batch of juice or nut milk. Download the CUBE302S Instruction Manual here.